In the blink of the eye Christmas came and went this year. We went over to my husband's family's house for dinner last night for what turned out to be a whole lot of overcooked food, but regardless it is always nice to share the holiday cheer with loved ones no matter how the food tastes. None of my husband's family knows that I have a blog, and I would like to keep it that way. Actually one of my aunts tells me repeatedly to take pictures of all of my outfits and I just nod and smile knowing that that's pretty much what I do as one of my hobbies. 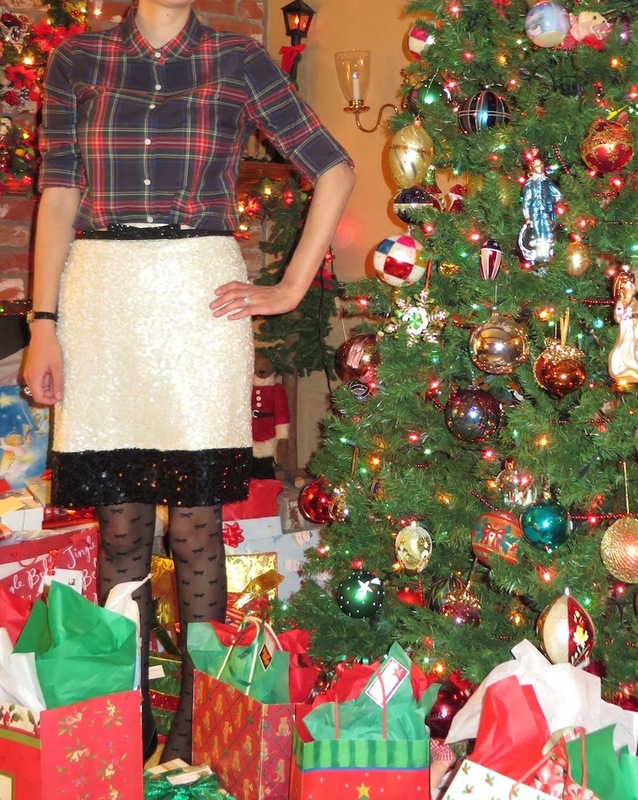 Given the anonymity of my blog amongst family it is always a little awkward to ask my husband to take a picture of my outfit in the midst of a gathering such as Christmas. My husband said "Well, don't worry about it, they already know you're vain...I mean concerned with your appearance." Well he's getting coal in his stocking next year. Anyway, when we arrived for Christmas dinner at around 5:00 I thought it would be festive to take a picture or two by the tree. What resulted was various family members instructing me on how to pose and smile. They're very bossy! 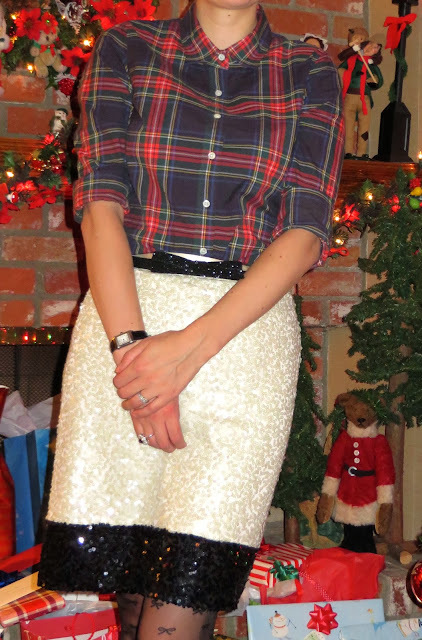 I added some little holiday details to make this ensemble extra special. These details included my Vera Wang bow tights, my sparkly bow belt from kate spade, and the debut of my birthday gift, which I haven't worn until now, which is a ring from Tiffany's Ziegfeld collection inspired by The Great Gatsby. On a side note this picture of my legs, now that I keep looking at it, sort of reminds me of that lamp in A Christmas Story! As you can see there were lots of gifts under the tree for everyone in the family. One of my favorite gifts is the sign shown below. I was thinking about hanging it on my desk at work! Something makes me think that wouldn't go over so well. So I don't know how I did this, but as I was uploading these pictures this thing on Google called "Auto Awesome" just made all of my photos either twinkle or have animated snow. Seriously, WTF Google? I didn't do this, but here is what one of them looks like. I would like to know how this happened so if you know more about computers than I do, please explain! Such a great outfit Katie! And that sign is fantastic and the google effects are hilarious!